This is one of those how can something so delicious be so simple. We are talking about the mushrooms. Portobello mushrooms marinated in garlic and tarragon then barbequed or grilled are utterly fantastic. We will happily take them over a steak any day. So much so we wanted to leave it at that for this weeks recipe, but it felt too lazy. So we made it into a meal – something a little naughty for the weekend, and vegan If you don’t add the cheese (add avocado instead if you wish). It feels like a mouthful of happiness – the charred mushrooms with the sweet onions and the salty Roquefort – dreamy. Mushrooms are one of the true pleasures about Autumn, the whole part and parcel. The idea of basket in hand and off to the wood you go like a true forager, having the feeling that you can live off the land, this is the new you – but were too look, and if you do find a mushroom being far too afraid to pick it, imagining the headlines the next day of some fool who ate a piousness mushroom in Hampstead Heath. So instead you quietly retreat, go to the green grocer where you find them happily, in all their glory waiting to be purchased. Once back home you can get back into your foraging boots by taking a brush and dusting off any dirt before throwing them into a hot pan with butter, garlic and parsley you have picked from your windowsill. A productive Saturday. We recently came up with a very good brunch dish – garlicy mushrooms with crispy kale, cheesy creamy polenta, a poached egg and smoked Ricotta. Smoked ricotta is a new revelation, we found that Natoora sells it and have been obsessed – it makes a great addition being crumbled over anything, salads, pizzas, vegetables, eggs, anything! That is what makes cooking so exciting, you never know what is lying ahead to surprise you – a little present, we all deserve a little present now and then. 1. To make the oil chop the tarragon and place In a bowl, pour over olive oil till the herb is all covered, and an extra splash for luck, season and leave to one side. 2. Place the mushrooms in a large bowl scatter over the garlic and spoon over the tarragon oil (saving a little for serving later), season and rub in with your hands, making sure all is covered, add more olive oil if needed. Place to one side to marinade. 3. Heat a little oil in a pan and add the red onion wedges, break up with your wooden spoon. Add the rosemary and sauté for about 5 minutes till starting to colour. Add a good dash of balsamic vinegar to it hisses, turn down the heat and continue to cook for at least 10 minutes. Take off the heat. 4. Light up the BBQ or grill when hot whack on the mushrooms and leave for a good 4 – 5 mins till dark golden (feels like its nearing to burn), then turn them over and cook till they have shrunk and quite flat, take off the heat and slice. 5. Cut the rolls In half and drizzle with olive oil and place on the BBQ / Grill, then turn. Take the mushrooms and the bread off the heat. 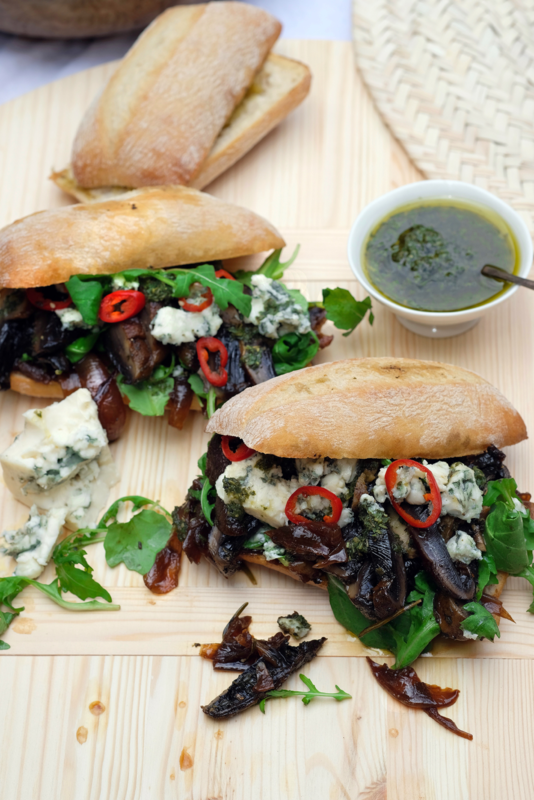 Place the bottom of the roll on a board and pile up the red onions followed by the rocket, then the mushrooms, tarragon oil, cheese and chilli if using, then place the top on the sandwich. Hangover heaven.